Metro Business Opportunities (MBO) is proud to help launch a new Social Enterprise that will make it easier for residents and visitors alike to choose local products and services, and live a more sustainable lifestyle. The Guide to the Good will act as an online directory, offering consumers an easy to navigate database of local, social, and green companies. The Guide to the Good will offer a valuable community service, while also providing local businesses and organizations with a unique and affordable promotional platform. By providing paid directory listings and featured blog posts, the Social Enterprise will generate a sustainable source of revenue for its parent not-for-profit organization – thegreenrock.ca – Live Sustainably NL Inc.
To help facilitate commercialization of their Social Enterprise concept, the not-for-profit turned to MBO for help with their business plan and accessing start-up financing. They worked with MBO’s Social Enterprise Coordinator, Bernadette Coady, to enhance the viability of their enterprise and secure the Support loan program. 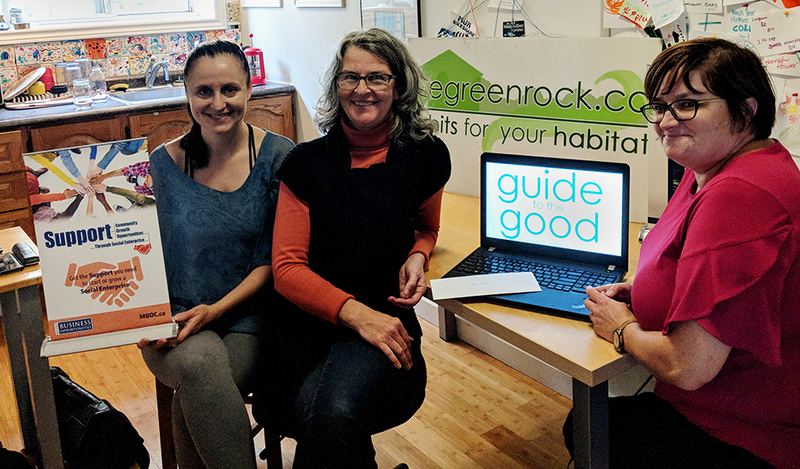 The Guide to the Good is now launching within the Northeast Avalon, and has begun a marketing campaign focusing on local, social and green companies. They are currently conducting market research to help shape Guide to the Good 2.0 for desktop and mobile, expected in 2019. — Kim Todd, Founder and Chief Creative Director, thegreenrock.ca – Live Sustainably NL Inc.
Thegreenrock.ca – Live Sustainably NL Inc. The Guide to the Good is the Social Enterprise of thegreenrock.ca – Live Sustainably NL. The website thegreenrock.ca first launched in 2011, sharing local stories on green living and sustainability. In 2014 the organization incorporated as a not-for-profit to become thegreenrock.ca – Live Sustainably NL Inc. Since its inception, thegreenrock.ca has championed sustainable living throughout Newfoundland and Labrador, and engaged the public by publicising local green innovations, aiming to provide information and inspiration to answer challenges facing our planet, our communities, and our lives.